Looking for parts and accesssories? VitalsBridge converts SimMan 3G's and SimMan Essential's digitized vital signs into signals that are compatible with a vital signs monitor. Compressed CO2 gas simulates the signals for non-invasive blood pressure and capnography. Practice makes perfect, and by using the patient monitors and your patient cables you would be using in a real life situation, your simulation training allows you to practice and perfect your evaluation of a patients' Vital Signs in a more realistic environment. It's easy to upgrade your existing SimMan 3G or SimMan Essential to include the VitalsBridge platform enabling you to use your own patient monitors during training. Just purchase the upgrade kit with VitalsBridge and install it with assistance from an FSE. It is important to know, that you can purchase an upgrade-kit installed by an FSE for your SimMan Essential or SimMan Essential Bleeding to broaden the functionallity of these simulators using VitalsBridge as well. 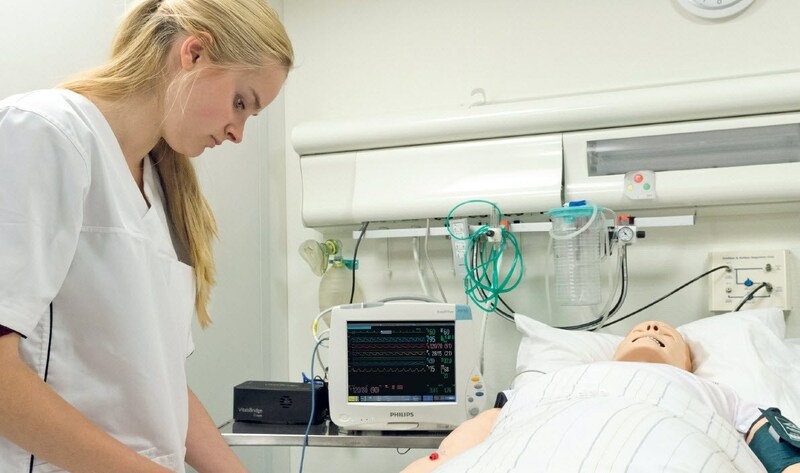 The vital signs created by the VitalsBridge are controlled using the SimMan 3G Instructor Application (LLEAP) and a piece of software that establishes a connection between VitalsBridge and the SimMan 3G, and gives you access to support materials for training from SimCenter. This way you can run pre-programmed Simulations, manage your training and provide students with informative feedback. VitalsBridge has been designed to function with different brands and models of commercially available patient monitors. VitalsBridge requires installation by Laerdal Technical Services. For more details, please contact your local Laerdal representative.